1) Calculate1’s complement of the subtrahend. 2) Add 1's complement with the minuend. 3) If the result of addition has a carryover then it is dropped and a 1 is added in the last bit. 4) If there is no carryover, then 1’s complement of the result of the addition is obtained to get the final result and it is negative. Example: What is the difference between two binary numbers 110101 – 100101? Solution: 1’s complement of 10011 is 011010. Here is another example of subtracting 101011 – 111001. First, let's calculate 1’s complement of 111001, which is 000110. * Java Program to add subtract two binary numbers. * can use Java API for doing binary subtraction. System.out.println("difference between two binary number is : "
* subtracting them using binary arithmetic. 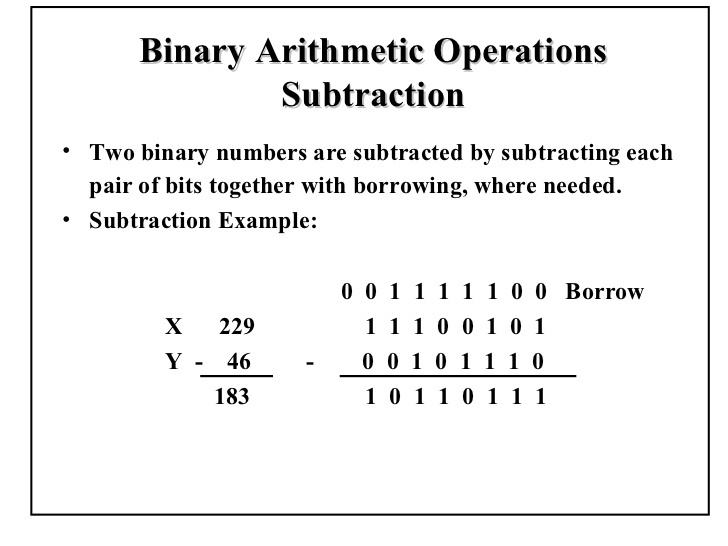 That's all about how to Java Program to subtract two binary numbers.